In the years following the uprising, every district is required to send a male and a female adolescent to compete in the annual Hunger Games. These games, which are televised nationwide, involve having these teens fight it out until there is only one left standing. When her sister is selected in the lottery, Katniss Everdeen (Jennifer Lawrence) volunteers to take her place. Will she be able to use her wits to survive? 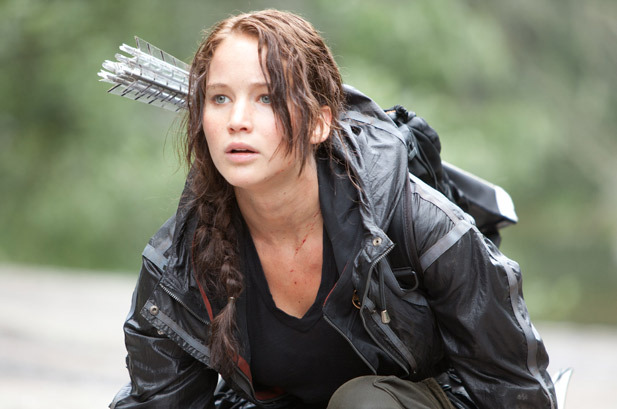 The Hunger Games, based on the dystopian novel by Suzanne Collins, is a movie that opened this past Friday. Once again, I’ll admit I did the wrong thing by seeing this movie without having read the book. Despite not having read the book, I did find the plot to be a little predictable. While President Snow (Donald Sutherland) was discussing his rationale as to why he holds these Hunger Games to begin with, I called out what his reasoning was before he even got to it himself. Other than that, I thought The Hunger Games was very well put-together. The whole movie was very beautifully shot. Much of it took place out in the wild, but every setting of The Hunger Games had its own personality from the coal mining District 12 Katniss came from to the bustling metropolis of The Capitol to the arena. As far as The Capitol, I also have to say the movie’s special effects did not fail to impress. What it reminded me of was Coruscant from the Star Wars prequels. Where the movie really shined was when the Hunger Game actually began. What the movie really captured was the shear desperation of (let’s be perfectly honest here) children who are literally told to fight one-another to the death. In general, I thought all the child parts were very well-acted, especially on the part of Alexander Ludwig as the murderous Cato. I have to say that the most disturbing part of part of the depiction of the opening of the children’s animal instincts is that children in real life would likely act that way if they were put in the same circumstances. I also have to praise the haunting musical score. Composers T-Bone Burnett and James Newton Howard, I felt, probably were the ones who contributed the most to creating the atmosphere The Hunger Games went for, and I must say that there was plenty of atmosphere in the movie. Overall, I thought The Hunger Games worked as a dystopian science fiction film because of how strong the atmosphere was throughout. While the plot was a bit predictable (again, I didn’t read the book) I thought in general the movie was well put-together. While it’s not saying much at all, The Hunger Games is the best movie of 2012 I have seen so far. It was very well adapted..
Nice review, I thought it was good but not great. I actually thought they had toned down the violence a lot. Did the shaky cam bother you at all? I did enjoy how the 1% was depicted as foppish dandies that cracked me up. What’s your take on Ross not being on board for the next film? enjoyed checking out your blog, I found my way over here via cuttingedgecreativity. As far as the shaky cam went, I could tell it was their way of avoiding depicting a lot of graphic violence on screen. It was pretty obvious that despite they chose to work with such subject matter, the producers clearly shot for the PG-13 rating and thus did everything they could to not slip into R territory. As far as directors go, I thought a lot of what I liked about this film was Ross’ directorial style. As it is, I heard the following books (I admitted in the review I didn’t read them) were not as good as The Hunger Games. Because Ross is not directing the sequels and because their source material wasn’t supposed to be as good to begin with, I feel like I’m unlikely to see them unless I read reviews saying that they really are that mind-blowingly good. I enjoyed your review. I read the books in anticipation of the movie because my daughter and husband had read them and they were eager to see the cinematic adaptation. I was sorry I did. I enjoyed the film but thought it was just ok. I didn’t find myself as emotionally invested in the characters on the screen as the ones on the page. The fact that the movie did not leave you wanting more is telling, IMO. The 1st book definitely left me wanting more. By the end of the 3rd one, I was glad to be done with it. All the same, I will probably see the sequels with my family at the theatre, and adjust my expectations. Yeah I definitely see where you are coming from. I remember certain parts of the movie (like when Katniss was under the influence of the hallucinogenic venom) where I could tell that there was supposed to be more interior monologuing going on in the book but was totally absent in the movie and thus I felt I was short-changed on character exploration.